Sample notice for expiration of employment contract to company employee with offer for extension of the contract with increased salary and other benefits. Employment contract expired date, time and final settlement. 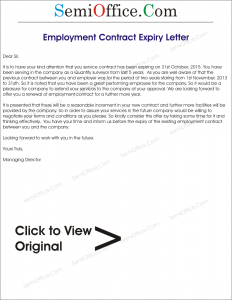 This letter is to inform you that your employment contract with Cape Industries Ltd. will be over in a few days. If you want to renew the contract to join again then please read the Company’s terms and conditions. It is to inform you that your employment contract with McDonald’s Pakistan has expired as you were on adhoc basis. McDonald’s Pakistan doesn’t have any further contract with you. 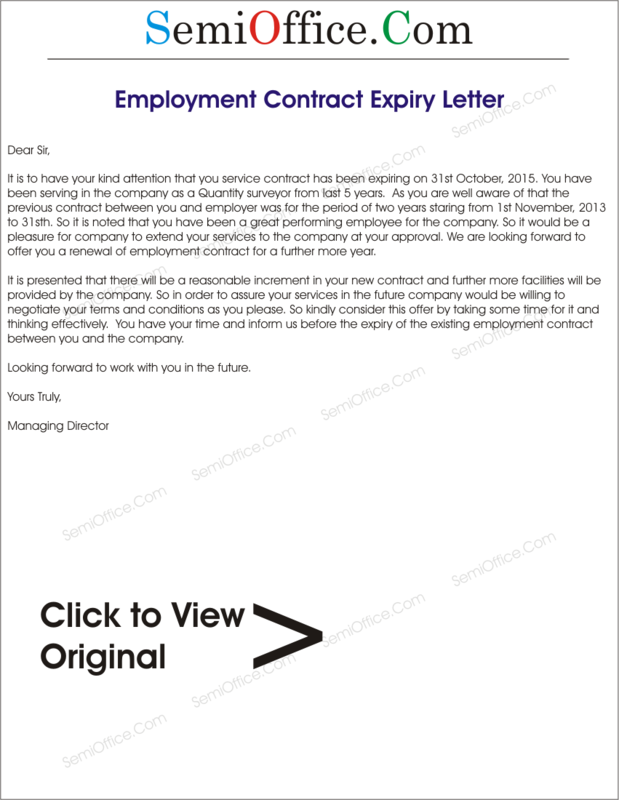 It is to have your kind attention that you service contract has been expiring on 31st October, 2015. You have been serving in the company as a Quantity surveyor from last 5 years. As you are well aware of that the previous contract between you and employer was for the period of two years staring from 1st November, 2013 to 31sth. So it is noted that you have been a great performing employee for the company. So it would be a pleasure for company to extend your services to the company at your approval. We are looking forward to offer you a renewal of employment contract for a further more year. It is presented that there will be a reasonable increment in your new contract and further more facilities will be provided by the company. So in order to assure your services in the future company would be willing to negotiate your terms and conditions as you please. So kindly consider this offer by taking some time for it and thinking effectively. You have your time and inform us before the expiry of the existing employment contract between you and the company. This notice is to inform about expiry of employment contract. As under the companies policies an employment contract for three years for every new employee. So as your contract is going to finish in about 10 days, we provide you an opportunity to renew your contract with some more additional privileges or you may notify us if you want to leave your job. In both cases the decision is yours. Please notify us about your decision within a week. It is hereby notified that your employment contract as a computer operator in London Fire Service has been expired and you are no more employee of the Service now. Anyhow, you have legal right to apply for the renewal of employment contract within one month of the date of this notification. You are also directed to report to the headquarters for surrendering of official motorcycle in your use and get clearance certificate for further use in your career.